This is the twenty-first entry of Russia’s Alien Nations: The Secret Identities of Post-Socialism, an ongoing feature on All the Russias, as well as the eighth entry of Chapter 1. It can also be found at russiasaliennations.org. You can also find all the previous entries here. The third potential author (or fourth, if Vail’ and Genis count for two) has the weight of philological authority behind him: the philosopher Mikhail Epstein. After all, inventing words is part of his stock in trade,and he (like Vail and Genis) has written a great deal about Soviet culture, which would suggest that, unlike in Gradsky’s case, the word “sovok” would have arisen as part of a larger philosophical or analytical framework. And, indeed, this is what Epstein himself has claimed in numerous interviews and essays. The clearest elaboration of his case can be found in a 2008 essay, “Sovki and Others. On the History of the word ’sovok’” (). 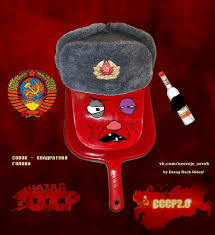 He rejects the connection between “sovok” and its literal meaning (“dustpan”) at the heart of Gradsky’s explanation: “If we replace it with “shovel” (“lopata” or “lopatka”), also used in children’s games, we see that calling people who are Soviet through-and-through “shovels” would be strange and inappropriate.” In other words, the term is based entirely on phonetic resemblance.